In case you hadn’t noticed, I love escape rooms, but I don’t look forward to them half as much as I do to A Door in a Wall‘s events. When you like something that much, you can’t help but share the love, so I’d emailed out to friends asking if they wanted to join me. 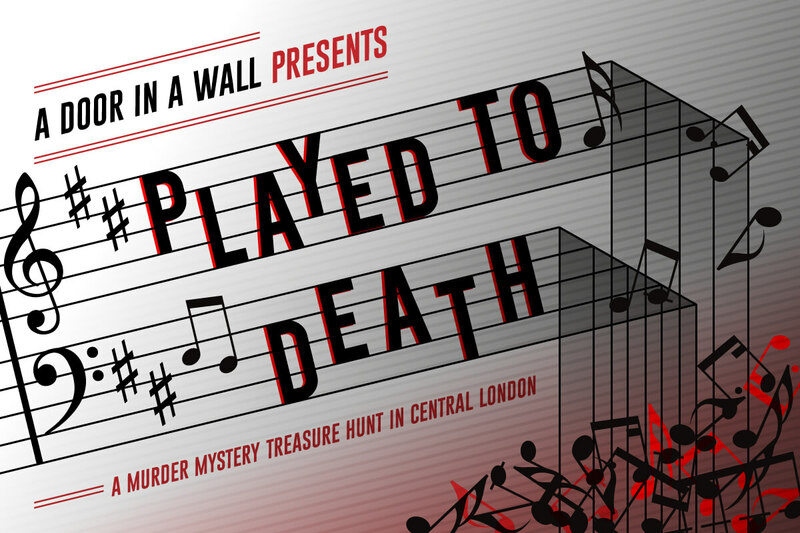 The result was that, on an overcast Wednesday evening in May, I dragged 39 of us down to Holborn to take part in the latest instalment, Played to Death. As well as puns (it’s a story of sax and violins…), they seem to have a love affair with pubs with fun-sounding names. Last time it was the Red Herring, this time the Square Pig. The story revolves around the Performing Artists Riverside Philharmonic (or PARP for short) who were about to put on a concert showcasing the new symphony from Aaron Eastring. Unfortunately, Eastring was killed by a falling piano and the police need your help to determine which of the three suspects is guilty. Once the initial acting was done, we were off out to the local area to follow our clue trails and try to track down the killer. One of the problems with playing against teams you know is that it becomes painfully obvious when you’re both doing the same trail. On previous occasions, we’ve not really known whether the people wandering along behind us were competitors or random tourists, but this time it was clear. In particular, it turns out we all had roughly the same idea for where to start, with five teams all heading to the same location. We took our backup plan of moving on to the next puzzle only to find we were still right next to one of the teams, as they’d done the same. Fortunately, this trail allowed you to pair up teams, so we could play in parallel, albeit with a bit of frustration. Truth be told, I was quite disappointed with that first trail. It involved some interactive theatre but the tasks they got you to do didn’t make much sense. Now, obviously, they often get you to do silly things, but they’re designed to make you look silly. This felt like it was trying to do that but failing. That was a minor quibble, though, and very soon normal service was resumed with some real highlights on the immersive theatre front. In general, the puzzles on the way round the trails were very straightforward. I have mixed feelings about that: obviously this is a fun game, so you should get most of the information you need in order to have a shot at solving the murder. However, obtaining the information so easily left me feeling that how well we did on the trails didn’t really matter. I’d much prefer to see a couple of harder puzzles on the way round that give you extra clues to reward those who do particularly well. After completing the six trails at a leisurely pace, we were just in time to head back to the starting point for the 9pm cut-off. Once again, A Door in a Wall managed the process seamlessly. Back in the pub again, we had forty-five minutes to work through the answer. Some parts of the puzzles were easy, but the hardest part required you to pull together several pieces of information. In fact, that’s one of the things I love about a Door in a Wall. You can’t just read through the whole thing and see the answer. Typically, you’ll read through each clue in turn and, by the end, you’ll have progressed one item. If you repeat that approach, then the next time round you’ll crack something else. As you continue, you slowly get more and more information about the victim/murderer until you’re pretty sure you know what happened. With about five minutes remaining, we cracked our final puzzle and handed in our answers. We made a clean sweep of the prizes – both joint first places, second place and the best team name (“Baching up the wrong tree”). To be honest, though, if you’re worried about winning or losing at A Door in a Wall’s events, I think you’ve missed the point. This is all about the experience and, in that sense, all the teams came away winners. (Oh, you want to know how my personal team got on? We didn’t win a prize…). Looking at it objectively, this was a fun evening and great value for money considering the central London location. It was a good combination of technology, puzzles, interactive theatre and story. The final murder mystery puzzle was fun to put together, but I felt a little let down by one of the pieces of interactive theatre, and the puzzles along the route were all very simple. Was it good value for money? Definitely. Three hours for thirty quid was a bargain. Was it as good value as their other shows? Probably not, but that’s a very high bar to reach. Put it this way – I’ll be signing up for their next game as soon as it’s announced. I find myself wishing this was in NYC. I had the same feeling about waiting around for the trails, I have to say it left quite a bad feeling in me…don’t think I will go again for their murder mysteries, it’s just not that new anymore! I also didn’t think the puzzles were hard enough and they really should have a way of solving some stuff without waiting around :S All in all I liked my first game with them (An appetite for murder) a lot but won’t be doing more games unless it’s a theme I’m very attracted to…still have tickets to their A Veiled Threat, not sure if I should go or pass on the tickets tbh.